1. Crossing your legs doesn’t cause varicose veins. Neither does wearing high heels. The pooling of blood is actually more commonly caused by prolonged standing and/or sitting. Other notable causes: obesity, smoking, lack of exercise and hormonal birth control. 2. They’re not just a cosmetic problem. Probably the most common misconception about varicose veins is that people only get them treated because they’re, well, vain. Though experts agree that varicose veins are most often not a health issue, they shouldn’t be ignored. Varicose veins cause fatigue of the legs, swelling and general discomfort. They can also be a warning of long term health risks including: deep vein thrombosis, blood clots, poor circulation and leg swelling,. 3. It’s definitely genetic, but don’t be too quick to blame one parent or the other. You can inherit the tendencies from either, or both sides of the family, and it can even skip a generation. 4. 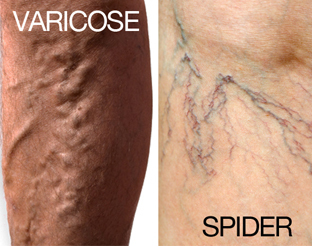 Varicose veins and spider veins aren’t the same thing. 6. Treatment is better than ever, so that’s good news is that treatment today is quite advanced. There are no scars, no cutting—very minimal recovery. And it is all offered at Reno Vein Clinic. Call us at 775-329-3100 to schedule a consultation. Our procedures are done in an office setting, away from the hospital and with no need for general anesthesia. 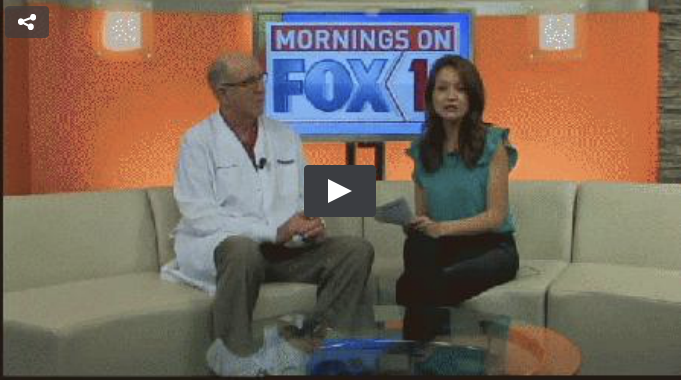 Dr. Robert Merchant, Vascular Surgeon at the Reno Vein Clinic, stopped by Mornings on Fox 11 to talk about how problematic veins can be. Varicose veins can be extremely painful and detrimental to a person’s overall health, but Dr. Merchant let us in on which new treatments are out there that can really help improve your health. We found this informative article from Mens Health.com and think it touches on some important aspects of vein health… especially for men. c) not a big deal. As many as 56 percent of men suffer from these ballooned veins, according to British research. And varicose veins are not just a cosmetic concern—they can lead to discoloration, bleeding, skin ulcers, and a “heavy leg” sensation that may hinder daily activity. The problem involves the veins in the lower extremities. When you are in an erect position, your blood pools in these veins, expanding the vein walls which over time stop returning to their previous, more taut condition. According to French researchers, people with a particular genetic variation have markedly weaker veins, and have almost twice the risk for developing varicose veins. “When the walls are weaker, it allows the veins to expand and eventually the valves [that regulate blood flow in the vein] don’t meet, which allows blood to reflux and flow in the opposite direction,” says Lowell Kabnick, M.D., director of the New York University Vein Center. When that happens, the person develops the bulged, gnarly look of varicose veins—causing symptoms that include throbbing, swelling, and decreased mobility. Exercise: This is the easiest way to maintain healthy venous structure and keep your vein walls strong. It’s important to involve your calves, which play a crucial role in maintaining blood flow from your legs back to the heart. Reduce standing or sitting pressure: Sitting, which has been catching a lot of blame lately, takes another hit here. Why? Blood naturally pools in your legs when you’re not moving, and sitting for long periods exaggerates the problem. Your solution: simply tap a foot, raise your legs, or take a walk. If you’re standing still, sway from side to side if possible. Beyond that, try to raise your legs or lie horizontally twice a day for 15 minutes to remove all pressure on your veins. Compression hose: Dr. Kabnick recommends everyone wear knee-length compression stockings—even if they don’t have signs of varicose veins. Compression leggings’ tension pushes the blood up from the ankle (the greatest pressure point), and redistributes it more evenly up the leg. If you don’t need prescription-grade strength, aim for hose with 10 to 30 millimeters of mercury (measurement of pressure). Watch your diet: Stay away from foods high in sodium (especially restaurant, frozen, and packaged foods) since salt leads to fluid retention. So, say you already have pain from raised bluish/brown veins. The good news is treatment of varicose veins has come a long way from the medieval-sounding “stripping” procedures of the not-so-distant past. Today, doctors use lasers to remove and seal shut varicose veins. It’s a quick, noninvasive, outpatient surgery—and pain-free, too. For minor cases, a doctor might suggest sclerotherapy, a chemical injection that destroys the damaged vein. “Going to the dentist is worse than removing varicose veins,” says Ronald Sprofera, of Jersey City, N.J. His surgery, performed by Dr. Kabnick, was over in 30 minutes. He never so much as flinched. Vein reflux, also known as venous reflux disease and venous insufficiency, causes blood flow problems in the legs and affects almost 25 million Americans. The heart pumps blood to the rest of the body and tiny valves act as one-way gates to keep it from flowing backward to the heart. When these valves leak, fail or no longer function, the blood is able to flow backward and this backward flow allows it to pool up in the legs. This pooling in the legs creates large, swollen veins known as varicose veins. If untreated, vein reflux disease can also cause pain, severe swelling, skin changes, skin ulcers and tissue breakdown. If you experience any of these symptoms or would like a vascular health check-up, contact the doctors at Reno Vein Clinic at (775) 329-3100 to set up a free consultation or visit www.renoveinclinic.com for more information. Spring! The perfect time to start exercising! As the springtime weather makes it’s way to our area, many are encouraged to take their activities outside. Staying active and exercising is a great way to promote vascular health and prevent painful varicose and spider veins. Physical activity also provides a myriad of other physiological and psychological benefits. According to the American Heart Association and American College of Sports Medicine, 30 minutes of daily physical activity is recommended to reduce both vascular and cardiovascular risk. Recent research has also indicated that in order to maintain good health, we need to combine both aerobic activity along with strength and flexibility workouts. Here are some examples of good workouts that have aerobic, strength and flexibility components. Hiking is great way to not only make the most of beautiful scenery, but increase the heart rate along with resistance as well. If you are new to hiking, start with an easy to moderate trail that’s flat and averages around 1.5 to 3 miles, as you become more comfortable with the terrain and workout you can increase your distance and difficulty. The health benefits of yoga come both in physiological and psychological forms. Increasing flexibility can also increase circulation, which can help prevent the deterioration of veins. Yoga also helps relieve stress, which is always an additional benefit. Swimming lessens the effect of gravity while still keeping the legs active, a big benefit for those who suffer from or are trying to prevent varicose veins. If you are new to swimming, treading water is a great way to begin to increase the heart rate and tone your arms and legs. If treading water is too difficult to begin with, simply walking along a pool floor or using a kickboard to move in the water.